Can the protests go beyond calls for greater electoral transparency, to embrace a truly social democratic agenda? The umbrella is a perfect icon for Hong Kong’s uprising: inclusive, aloof, a bit Anglophile and pragmatically defiant of the elements (and according to cinematic lore, readily convertible to a lethal kung fu weapon). It embodies the central plea of the protesters amassed in “Democracy Square”: a civilized demand for self-determination. 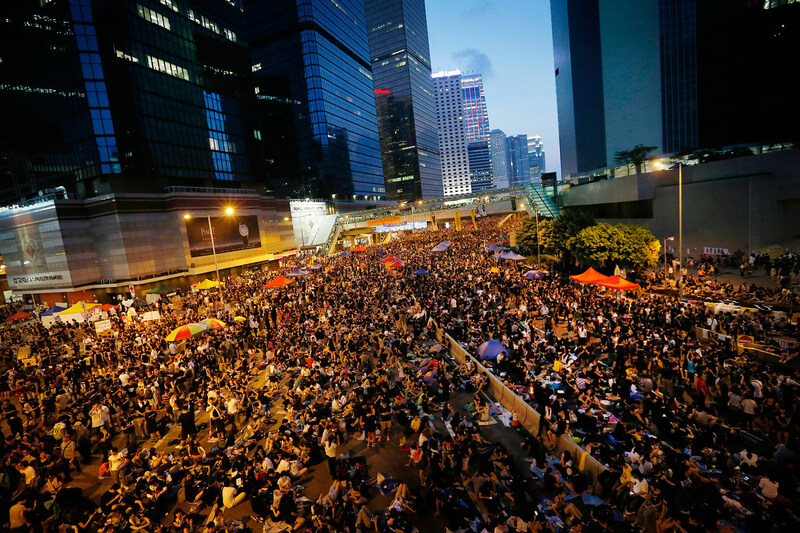 Yet the biggest worry in Beijing right now isn’t the threat of universal suffrage, but what comes afterward—the struggle for social justice that Hong Kongers face they pivot between post-colonial limbo and authoritarian capitalism. As Eli Friedman points out, Hong Kong is both an amazingly sophisticated and intensely unequal economy, compared to other “developed” nations. One-fifth of the population lives in poverty. The minimum wage, just recently implemented at the rate of US $3.60, hardly offsets the astronomical costs of housing, inflation and unemployment. The former colonial trade hub has lost about 80 percent of its manufacturing jobs since the early 1990s, as industries have shifted to the mainland. The most impoverished are often migrant laborers, youths and women. The radicals at the core of #OccupyCentral represent twentysomethings who are tired of the volatility of the economy and the stagnation of the country’s political system. The latest uprising was portended last year when dockworkers staged a major strike to demand stable, fair working conditions. They galvanized international solidarity in criticizing multinational corporations’ degradation of global labor rights. So far, Beijing shows no signs of heeding the demands for free elections or the resignation of mainland-aligned Chief Executive C.Y. Leung. Protesters are doubling down, too, heartened by a groundswell of international solidarity actions. And so the brittle “one country, two systems” policy is steadily unraveling. Not necessarily because Beijing has tried to impose its rule directly—for the most part, Hong Kongers enjoy infinitely more civil freedoms than their mainland counterparts—but because Hong Kong, on principle, just wants to be able to claim full freedom and self-rule for the first time in its modern history. The voices of Hong Kong’s workers are instructive for international observers. It’s too easy to draw a simple parallel to the Tiananmen Square pro-democracy protests. The idealism is there, but universal suffrage is a means to an end, the first step away from decades of being lorded over by reactionary ruling elites—one building block toward social democracy. In 1997, Hong Kong was handed over by Britain to its “motherland,” the crown jewel of China’s new empire. But the deal turned out to be more than what Beijing had bargained for. The mainland regained a piece of territory, but it never conquered the hearts of a people who are ready for true decolonization and will settle for nothing less.